​This is my 44th year of shows! My first show was in August 1975......it was an old home day show in Gilmanton...and I sold little soldier Christmas ornaments for $1.00 ... times have changed. Does anybody have one of those ornaments??!! What began as a hobby over 40 years ago has become my main focus today. 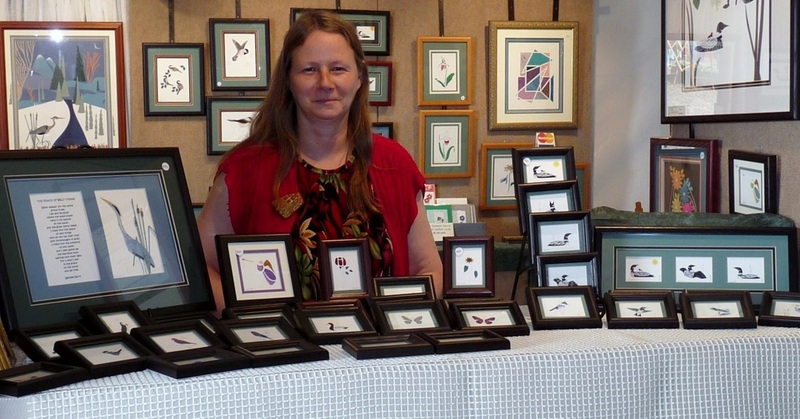 Quilling gives me the opportunity to combine my love of nature with my love of art, and the League of New Hampshire annual August fair gives me a wonderful outlet for my work and the motivation to pursue new ideas. My original technique of overlaying a simple cut out over the quill work has allowed me to incorporate the traditional craft of quilling into my ducks, birds, wild flowers, and other wildlife. The cut out is the design and the quill work is the detail for the feathers in the ducks and birds, the veins in the flowers and leaves, the scales on the fish, and the fur in the moose and polar bear. This technique has taught me to "see again" as the shading requires sometimes tedious time and patience to get it right. And if you don't see it, you can't recreate it. I feel that my quill work and cut out technique has pushed my quilling to change from craft to art. Oftentimes, my quillwork defies recognition -- this was a statement from a client which I had to quote. I have now added paper sculpture and paper cut work to my pieces. Its all about the paper. I am also working on scenes and large pieces -- The time for production has passed and it is now time to be much more creative. I want to create pieces that will make you stop and rest awhile, pieces that you will really want to be a Part of Your Life. In 2013 I designed a new line of folk art pieces......quilling my way in country designs that use a lot of color and whimsy. And they are fun! I look forward to many new designs as my creativity kicks in. Just a little note here....I do everything from the initial design, the cut out with an exacto knife, the quilling, cutting the mats and the glass, and mounting in the frame. Just me. And that doesn't count the shows, ordering supplies, and everything else involved in producing and selling my art. And my website. And my facebook page. I should say here that my husband does help me pick up at the Craftmans Fair and my son does help load and unload the truck at home, and helps me set up my booth. So I don't quite do everything alone. I sell only retail, as I am working by myself and cannot produce large numbers of work. I can ship directly to you if you wish to order on the phone or now you can use my secure shopping basket with paypal. Call me, let's talk. Or stop by the Craftsman's Fair, always opens the first Saturday in August. This will be my 33rd year! In 2010 I decided to reduce my number of shows in order to set priorities in My Life -- they say to reduce the stress!! I have now only one show a year. In 2015 I added new pieces to my line of folk art designs. These designs are all one of a kind -- what this means is that my cut out may be the same, but the coloring and quilling will all be different. My new designs for 2015 included whimsical roosters, horses, dogs, cats and birds. In 2016 I explored many new ideas. I started a new series of wildflower gardens, which can be seen on my new work, gardens page. These wildflower gardens are a tribute to my Mom, who loved her gardens. My gardens are quilled, because I have a brown thumb, something about needing to water the real flowers. So quilled flowers it is......here's to you, Mom. And knowing that your gardens in heaven are beautiful, and knowing that my Brother and Dad are helping you out. ​In 2017 I added skyline gardens and windowbox gardens. And for the first time, I played with a couple of landscape pieces. The Landscape pieces continue to grow and this year, 2018, I have many one of a kind landscapes. My favorites are always the river, the mountains and the sunsets and sunrises. And always with a tree or two. Nature, of course. This year, 2019, brings with it new little gardens which will debut at the Craftman's Fair, as well as a new butterfly series. I am also looking to grow my business through my website. I will be launching an email biweekly highlight of a product and perhaps an offer. If you are so inclined, please sign up for my newsletter with the little tab on my website or at my exit popup....tech is wonderful but challenging for me! Thanks for stopping by my studio. If you want to see the Family behind the artist, check out my family album.